KAZAN, Republic of Tartarstan, Russia. Needing only a draw against Russia to advance to the semifinals of the Confederations Cup, Mexico booked their place in spectacular fashion, with a 2-1 win over the Sbornaya of Russia in Kazan. Nestor Araujo (30′) and Hirving Lozano (52′) contributed to a comeback win over the hosts with spectacular, brave goals, overcoming a well-taken opening goal by Aleksandr Samedov (24′). In the opening phases of the game, Russia utilized their physicality and aggression to try to make El Tri timid in their defending, and generate chances on goal. And on two occasions, the aggression led to what could have been penalties for Russia, but Saudi referee Farhad Al-Mirdasi and his crew, including the video assistant referees, did not agree with most of the more than 41,000 spectators in the stands. But eventually, in the game’s 24th minute, it did allow for Samedov to get around the Mexico defense to latch onto a curling ball and finish it past goalkeeper Guillermo Ochoa to open the scoring. 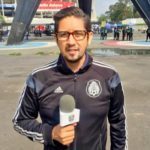 Six minutes later, El Tri got themselves back on level terms when Nestor Araujo placed a sharp-angle looping header past Russia goalkeeper and captain Igor Akinfeev to equalize. The fact that Araujo’s header was headed on goal and not to a runner who was defended, could have surprised Akinfeev. In the second half, the Sbornaya continued to operate more from possession, but El Tri started to find more chances, and gain their viveza. And off a botched Sbornaya set piece and defensive breakdown seven minutes in, Hector Herrera found Hirving Lozano on a long ball to put El Tri in front. El Chucky finished the chance with a header against a direct, physical challenge from Akinfeev into the open goal. With Portugal up 2-0 over New Zealand, the Sbornaya needed to score two goals to have any chance of advancing. But El Tri nearly got their third when a curling ball found Hector Moreno unmarked a few minutes later. 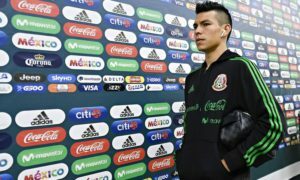 Moreno finished the chance for what looked like Mexico’s third goal, but the video assistant referees ruled out Moreno’s goal because he had started his move just a step offside of the last defender. Russia found themselves down a man in the 67th minute when midfielder Yuri Zhirkov was sent off on a straight red for an elbow on a duel near the touchline. 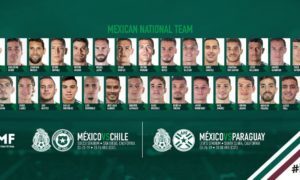 However, they will have to embark on their semifinal without captain Andrés Guardado, who will be serving a yellow card suspension after getting booked for a late tackle in the first half. 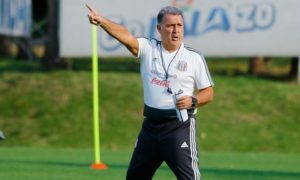 Juan Carlos Osorio could lose the services of Diego Reyes, as well. The Real Sociedad center-back, who started at right back in today’s match, had to be subbed off due to an injury in the second half.